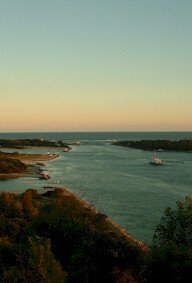 Lakes Entrance has a temperate climate with average mild winter temperatures. It is ideally located in the heart of the magnificent Ninety Mile Beach and the Lakes and Wilderness Region, Victoria, Australia. In Lakes Entrance there are many interesting sights such as the fishing industry, unique sculptures, a variety of shops and breathtaking natural beauty. Being a small coastal town, most facilities and attractions are within walking distance, making it the ideal spot to have a holiday without using a car. Lakes Entrance has a variety of excellent restaurants and take-away facilities, including Italian, Mexican and Chinese Restaurants. There are many facilities for tourists to enjoy, such as golf, bowling, mini-golf, boating, fishing, lake-cruises, winery tours, tennis, squash, paddle boats, water skiing and much more. 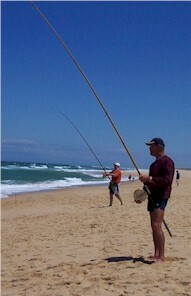 There are many other attractions only a short drive away such as the Buchan Caves, Metung and Paynesville. From Paynesville, take a ferry trip to Raymond Island, which is well known for its koala population and which attracts visitors from Australia and all over the world. If you enjoy cycling there is the East Gippsland Rail Trail. This is a long trail which takes you through forest and farmland landscapes. The Rail Trail has gentle gradients resulting in easy and relaxed cycling. The Rail Trail is also perfect for an extended walk. 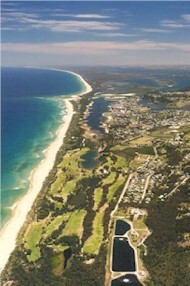 Or go on a scenic flight and discover Lakes Entrance from the air. Copyright © 2008 Lakes Internet Promotions. All Rights Reserved.